Moscow’s three major airports demonstrated mixed operational results in April this year. Whereas traffic through Sheremetyevo and Vnukovo continued to grow at an impressive rate, Domodedovo’s passenger numbers went downhill. Some 2.2 million passengers travelled through Domodedovo (DME) last month, 4.3 per cent less than in April of last year. The airport says that its traffic to destinations outside the CIS region continued to grow, however the total numbers of international traffic (including the CIS segment) accounted for 957,200 passengers, which is down 4.3 per cent year-on-year. Domestic passenger traffic at DME slowed down even more, by 7.7 per cent year-on-year to 1.2 million. One of the factors behind the drop was the decision by regional carrier RusLine to move its Moscow base to rival Vnukovo airport. Vnukovo (VKO) nevertheless remains the fastest growing of the three airports. Its April expansion rate was 19.4 per cent as it handled 1.524 million passengers, an improvement put down to “successful cooperation” between the airport and its base airlines, as well as attracting new airline customers, the airport explains. International traffic through Vnukovo increased 33.2 per cent to 507,000 passengers, with Antalya, Istanbul, Phuket, Baku, Dubai, Larnaca, Dushanbe, Tbilisi, Milan, Goa, Bangkok and Minsk ranking highest among the most popular destinations. Domestic traffic through VKO grew by 13.5 per cent to 1.017 million passengers. Within Russia, the most requested destinations were Sochi, St Petersburg, Krasnodar, Rostov, Mineralnye Vody and Makhachkala. 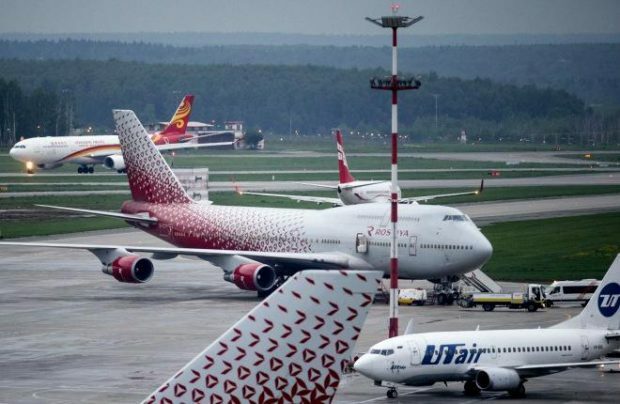 During the month, Russia’s UTair generated 33.4 per cent of all of VKO’s traffic, low-cost carrier (LCC) Pobeda Airlines accounted for 26.3 per cent and its sister airline Rossiya Airlines (both part of Aeroflot Group) ranked third with a 22.9 per cent share. Turkish Airlines carried 51,800 passengers through Vnukovo, ranking it in fourth. Other significant contributors include Russian leisure carrier IFly, Azerbaijan’s AZAL, Georgian Airways and Hungarian LCC Wizz Air. Russia’s largest airport Sheremetyevo (SVO) continued on its growth path, handling 3.525 million passengers, up 14.8 per cent year-on-year, out of which 1.855 million travelled internationally (up 10.4 per cent) and 1.670 million used domestic services (up 20 per cent). The airport specifically points out that its transit traffic increased by 3.6 per cent in the period to 603,000 passengers. The most popular onwards connection flights featured Tel Aviv – New York, Tel Aviv – Bangkok and Shanghai – Istanbul. In the first four months of the year Sheremetyevo handled 12.629 million passengers (plus 12.7 per cent), Domodedovo processed 8.1 million (minus 2.4 per cent) and Vnukovo 5.479 million passengers (plus 21.8 per cent).